This is the tomb of the steward to the Great Royal Wife Queen Tiy, wife of Amenhotep III. 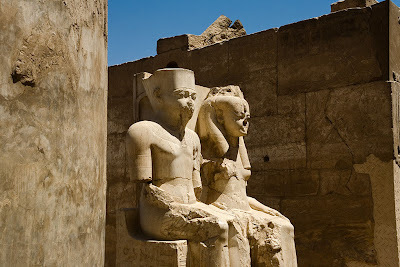 It was never completed, but it is interesting to observe that, while other noblemen of the 18th Dynasty, like Ramose for example, abandoned Thebes and went to the new capital of Tel el Amarna, Kheru-ef remained on, and served the royal mother. Also interesting is that a hymn to Amon-Ra laid out in crossword fashion (which is effaced but has been carefully reestablished by scholars) shows Amenhotep IV (later Akhenaten) adoring Ra-Harakhte, and offering libations to Amenhotep III, his father, and Queen Tiy. 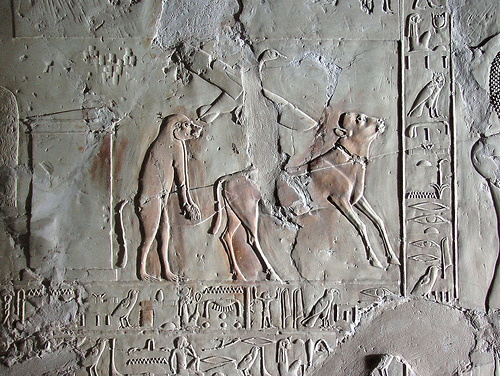 The reliefs are finely carved. On the left-hand wall, on the outer lintel, the royal couple adore the deities, and the texts on the jambs mention the parents of the deceased. At (a) is a processional dance in their honour. At (b) and (c) the deceased is being rewarded; he stands with officials before the pharaoh the goddess Hathor and Queen Tiy in a kiosk. Towards the end of the wall (d) are delightful representations of the Heb-Sed jubilee. The royal couple are depicted in a boat, and also shown leaving the palace. Eight slim princesses bearing vases with sacred water, walk in pairs. There are female dancers, jugglers and priests. On the right-hand wall, at (e) the royal couple raise the Djed pillar of Osiris amidst great celebration. There are male and female dancers, singers and offering-bearers. Boats bring provisions and butchers, cattle and donkeys are driven round the walls of Memphis; the latter w'as a most ancient tradition. At (f) and (g) the deceased is represented in another Heb-Sed festival, in which he offers a decorative floral vase and necklaces to the royal couple, and Nine Bows, representing the conquered territories.